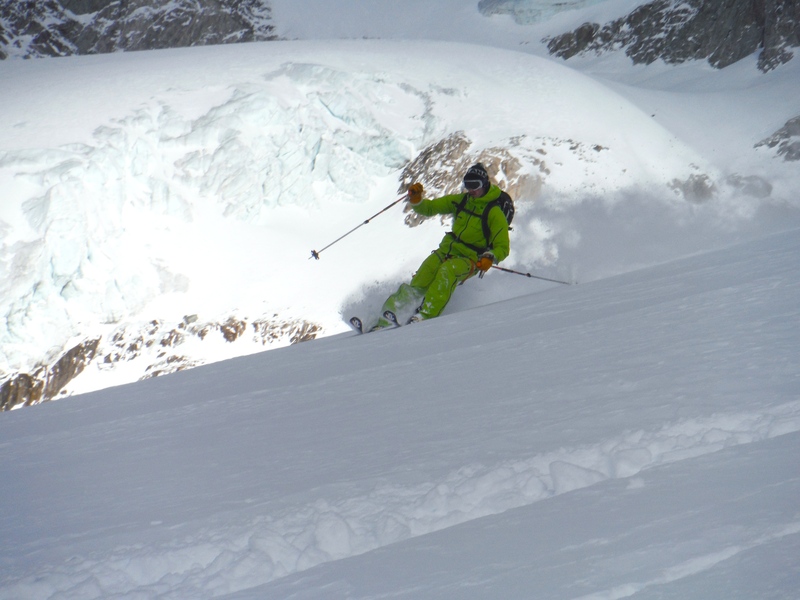 Monday was a mixed bag of skiing. 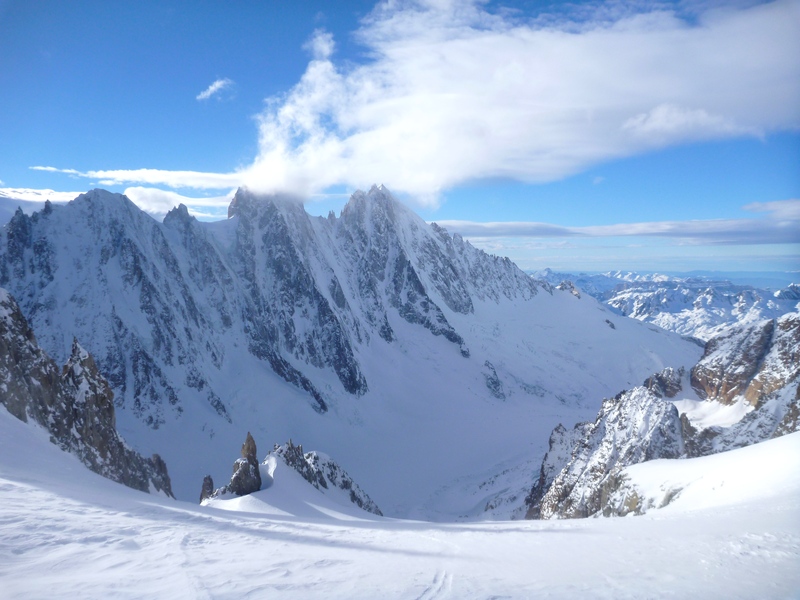 Waking up early for first bin at the Midi at 8am then having to wait until 10am to get on a bin, Already behind schedule… After getting to the top and reversing the upper section of the Cosmiques Arete to go and ski the South Couloir we found ourselves waiting again. 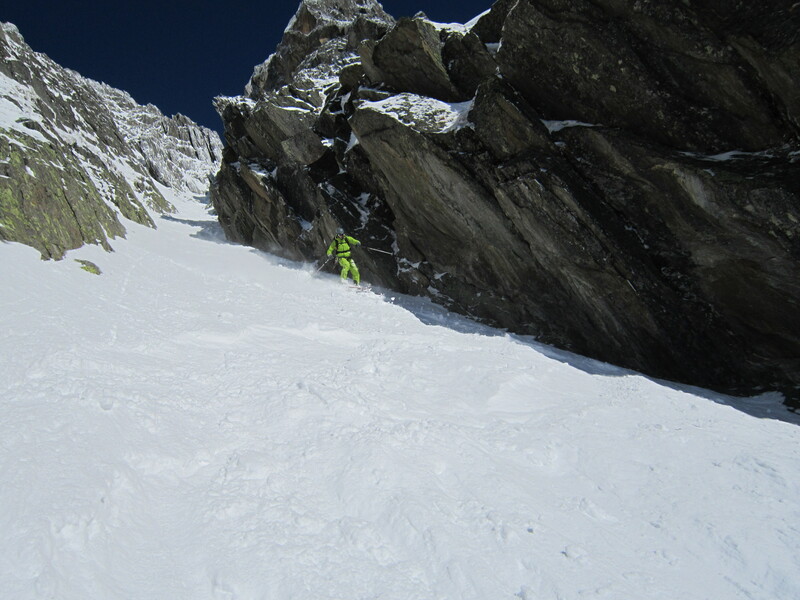 A guide was taking two clients up the couloir and they were unbelievably slow. The guide wanted us to wait, but after 20 minutes of hanging around watching the sun slowly melt the snow and start to sluff off we told the guide to move his clients to the side and we skied it one by one. 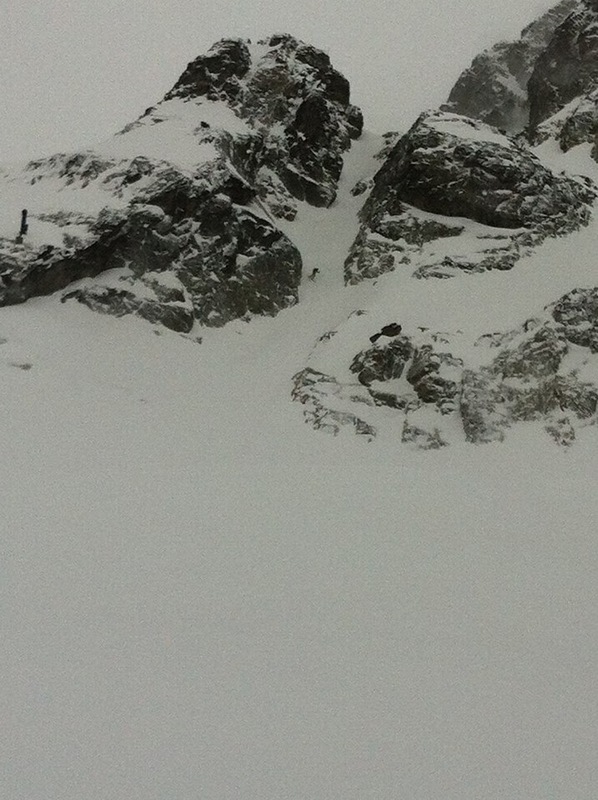 He gave each one of us a mouthful as we skied past! Nice skiing but the snow was not 100%. Next delay! 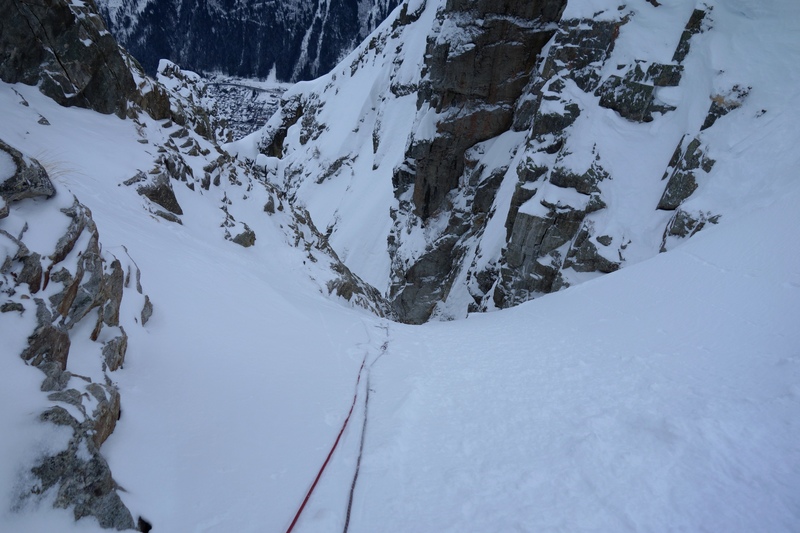 After skiing the south couloir we then arrived at the right hand rappel of the Cosmiques west Couloir. 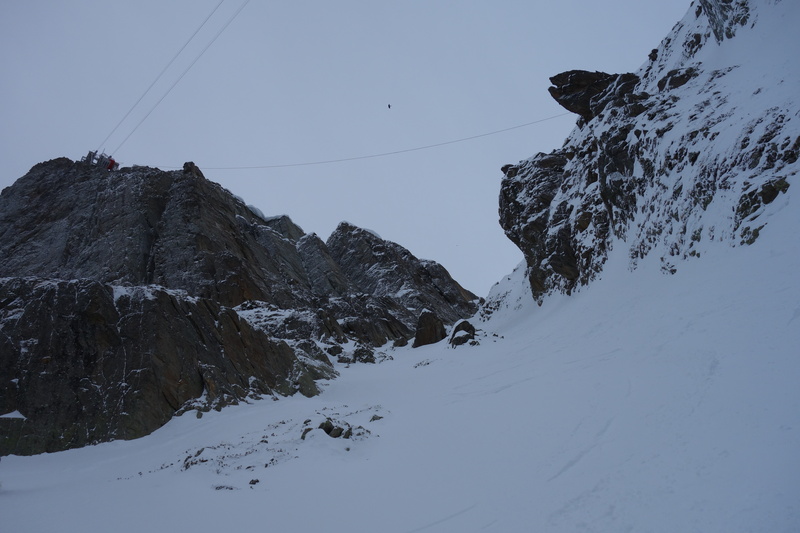 Waiting another 20/30 minutes here as some guys tried to pull their rope down and got it stuck we were becoming very impatient and we were watching some big movements across the Gouter face and the snow was starting to change and become heavy. Watching Pete and Grant finally rap in, James and I decided we would just go and do a Gros Rognon as we couldn’t be bothered with the exit after al this time we had taken. Such a good choice! 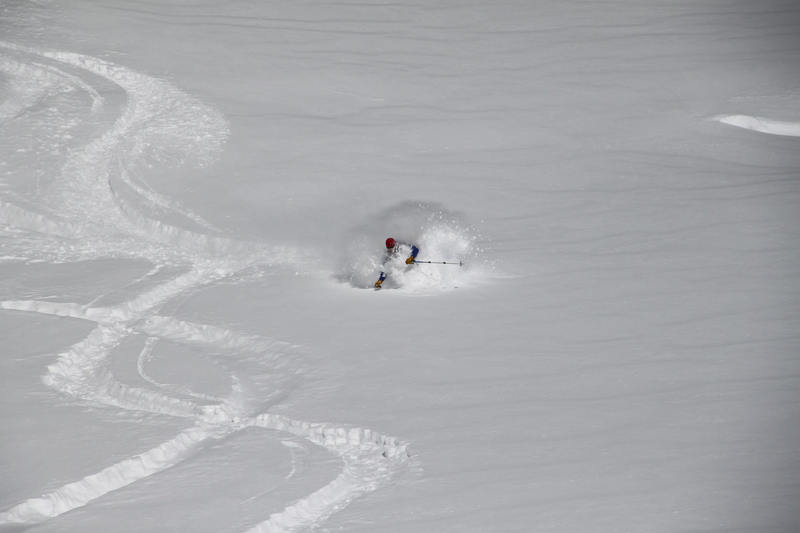 Thigh deep, cold powder awaited us all the way down Gros Rognon and with the James Bond track in perfect condition. We were back to town pretty soon. Grabbing some beers and Luke we were on last bin at 4pm going back up the Midi. Chilling with a beer on the arete soaking up the views we were the only 3 people skiing Gros Rognon at 5pm! 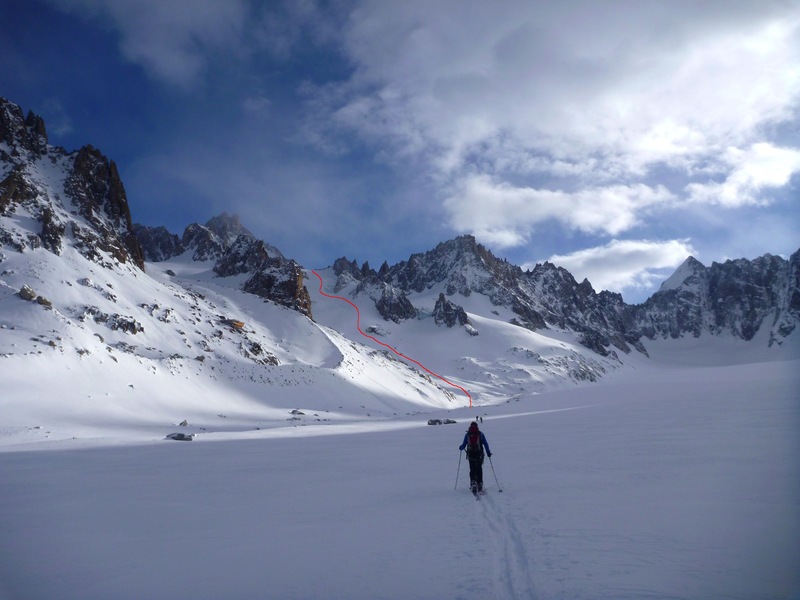 The snow was still perfect and after stopping for another beer at les Mottes hut we skied the James Bond at dusk to return to Elevation for 6:30pm. All in all a great day despite the waiting around! 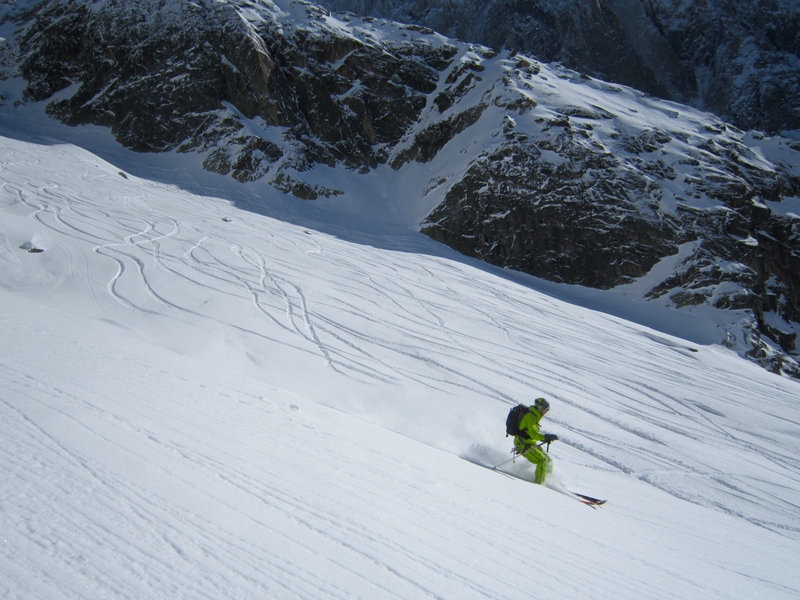 Thanks to James, Luke, Pete and Grant for another great day up the Midi! Click HERE to watch a video from Monday! Luke deep in it at 5pm! Waking up to blue skies and fresh snow has become a rarity this winter. So when I woke up at 9am on tusday morning after getting home at 4:30am I was quick to get ready. Showering and downing a pint of berrocca I was out the door for 9:30 heading to meet Rich at the Midi. 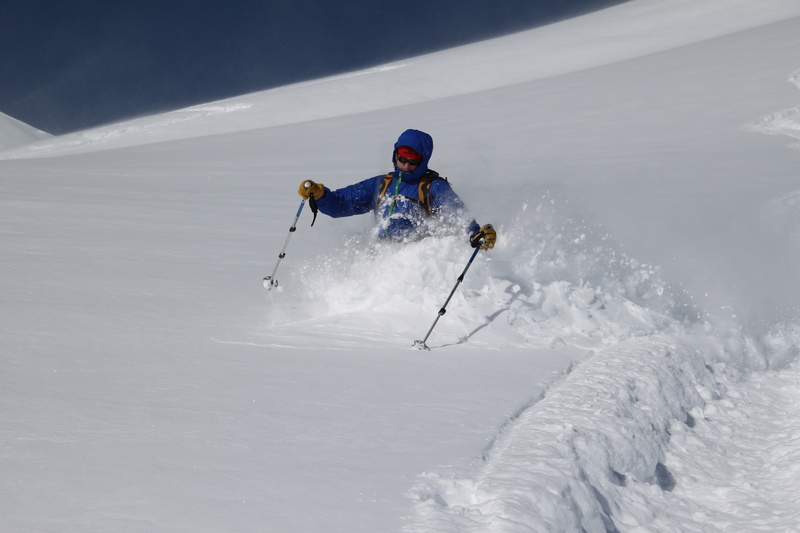 I had done skiers left from the mid station a week before and was keen to give it another go in blue skies. We had nice deep cold snow all the way down the the valley and only a couple of tracks could be seen. 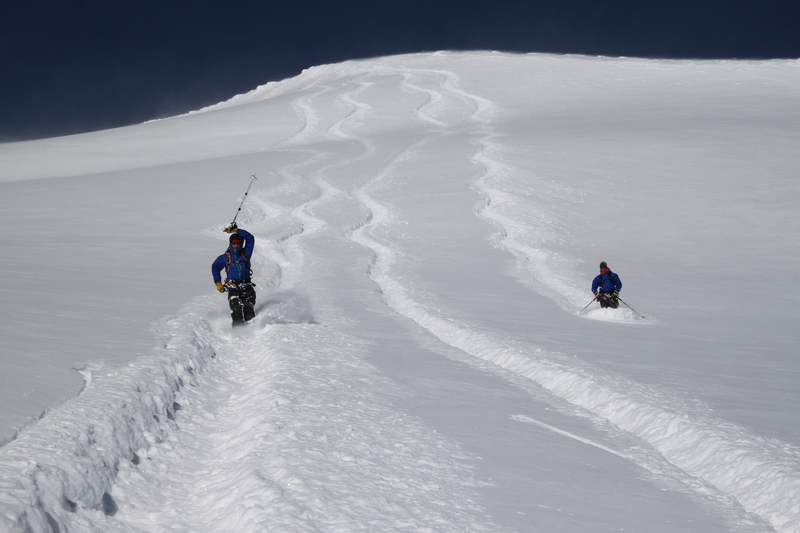 Heading up for another and we were treated to another 1200m of powder! 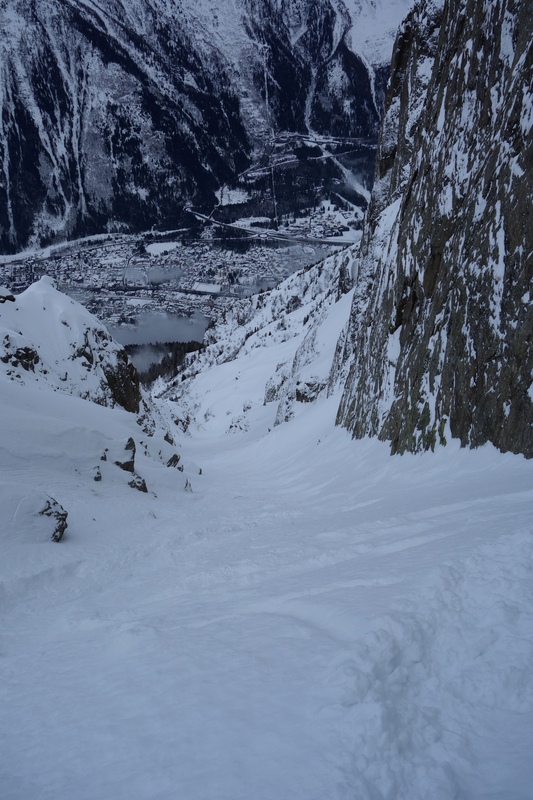 With 2 plan laps in we fancied heading to Grand Montets to see if the little bochard hike was still good. It paid off. 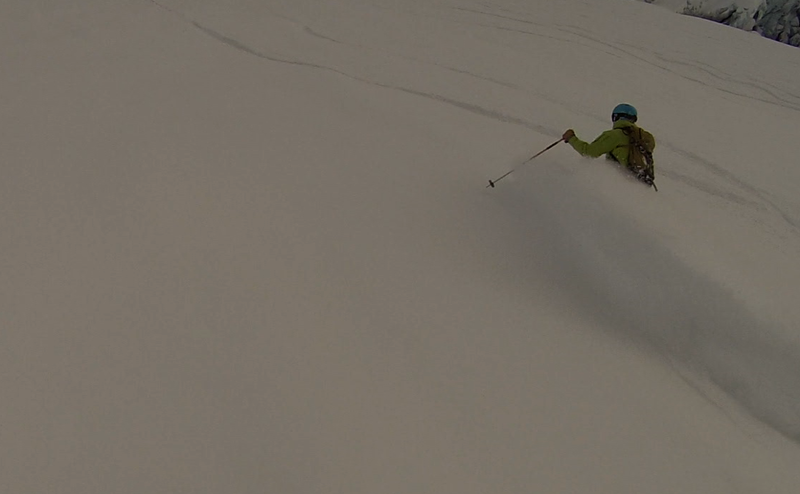 Skiing it 3 times after 2p,m with fresh deep snow all the way. Although it is a short ride its fun and steep and always less tracked than the rest of GM! What a good day, we have been waiting a while! 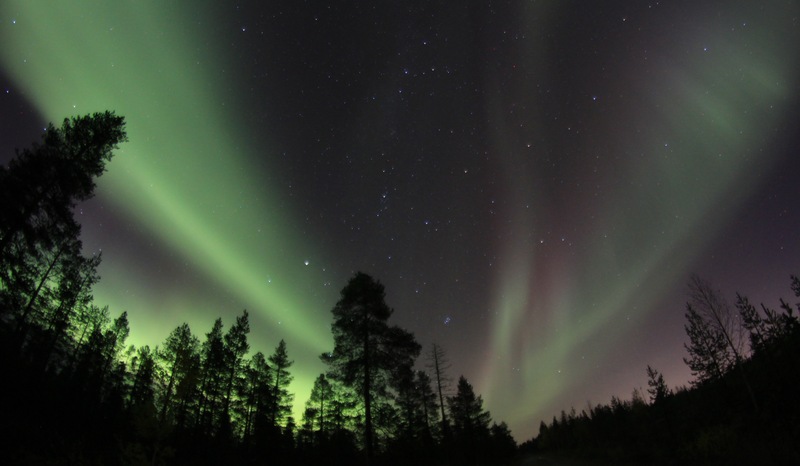 Click HERE to see a video from Tuesday! 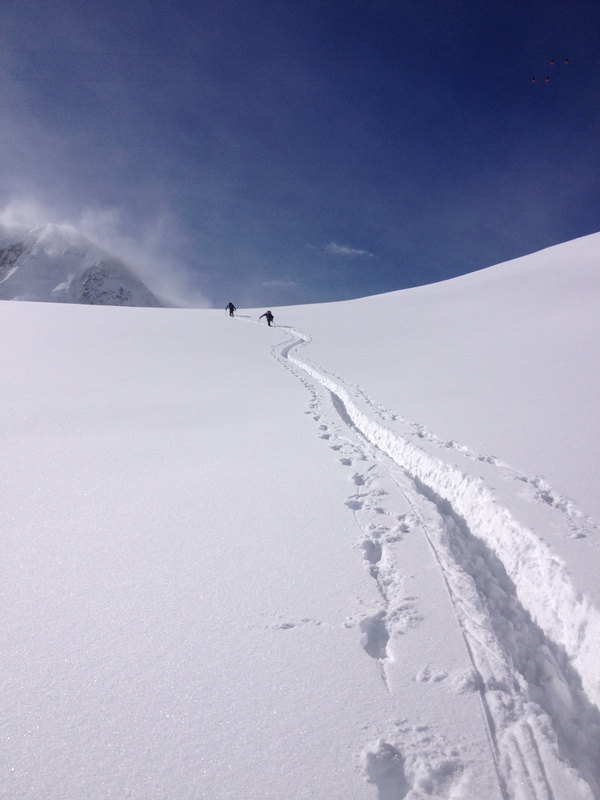 Over 8 inches of lovely cold snow fell in Chamonix yesterday. This put a hold to my Cosmiques first bin idea as I knew I couldn’t make it home for work at 1pm if the midi was late opening. Change of plans. 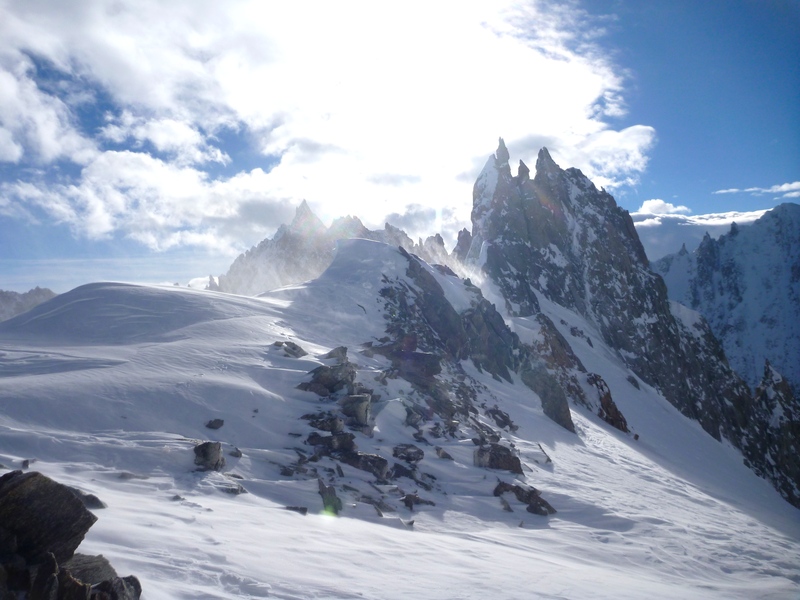 Ally Swinton and I were at Brevent for 9am. Waiting until 10:15 when they finally opened top ticket, we were in the first group heading towards E.N.S.A. 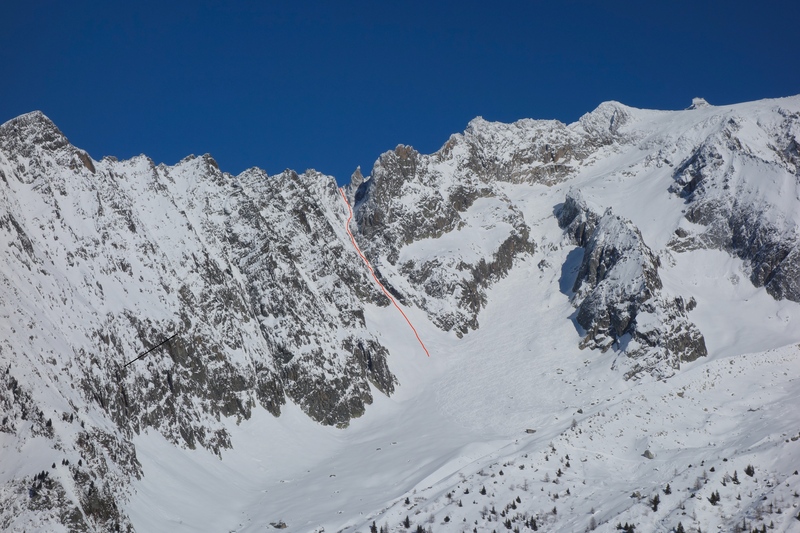 Watching 3 balls-out riders huck the 3m cliff into the narrow couloir while we set up our rope for the rap! The snow was perfect. Nice and cold, deep powder. 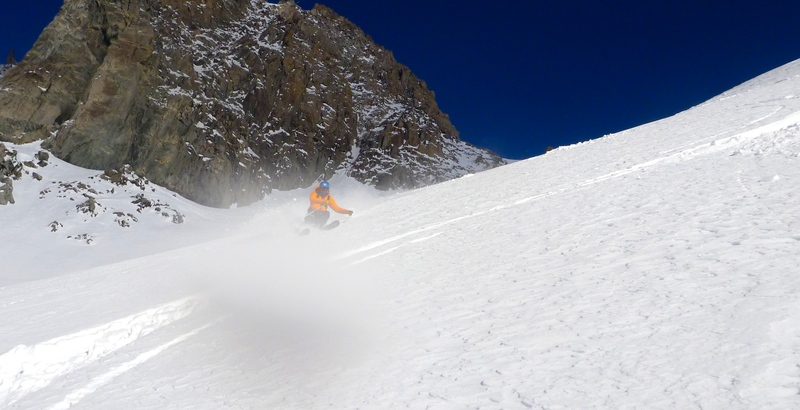 Charging down the couloir we found nice snow all the way back to town where we headed home. As quickly as we were in, it was over. Both with big smiles and plenty of snow on our faces! Cheers Ally for the photos and for being nice and quick! Picked up some alpine boots yesterday from Footworks. I have never worn a pair and they are nowhere near as comfy as my La Sportiva touring boots! What a baptism of fire they had! Should be able to charge harder than in my touring boots, and they wont fall apart as quick now! Just missed the money shot! 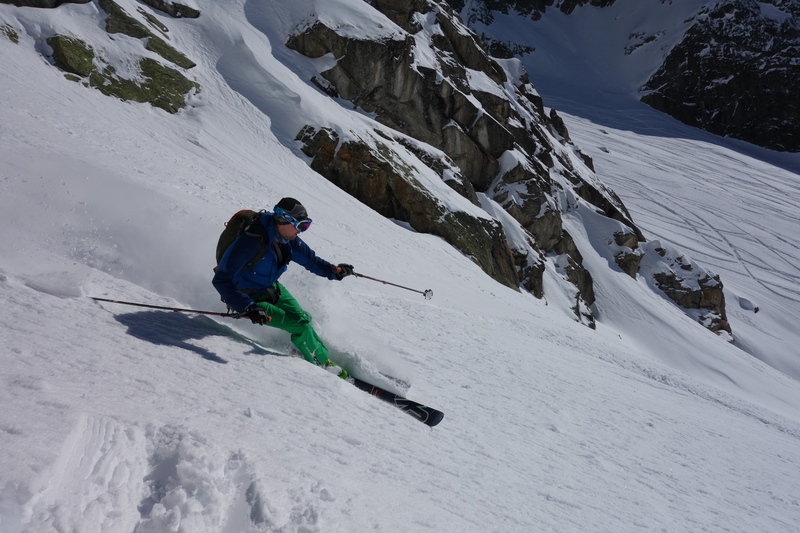 Skiing E.N.S.A and Bellim on sunday had me in the mood for more couloirs, and after some more snow on sunday night and a good powder day up Flegere on Monday I thought that the Poubelle could be a good choice. 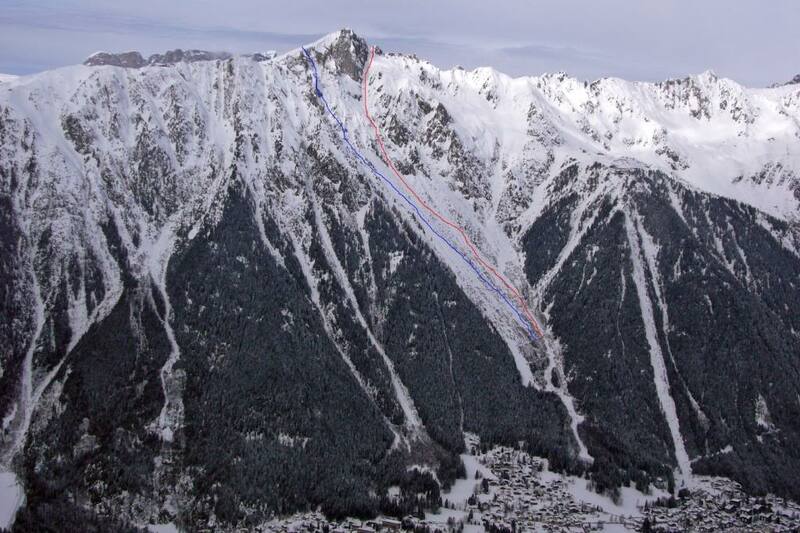 Easily accessed from the Bochard gondola at Les Grand Montets you ski the 50 m towards the obvious roped off couloir. It is possible to side slip in which someone had done already but with the ropes in the bag and our harnesses on we thought it would be quicker and definitely safer to rap. After a 30m rap we had our skis on and it looked good. Slightly choppy boot deep light powder on a firm base. 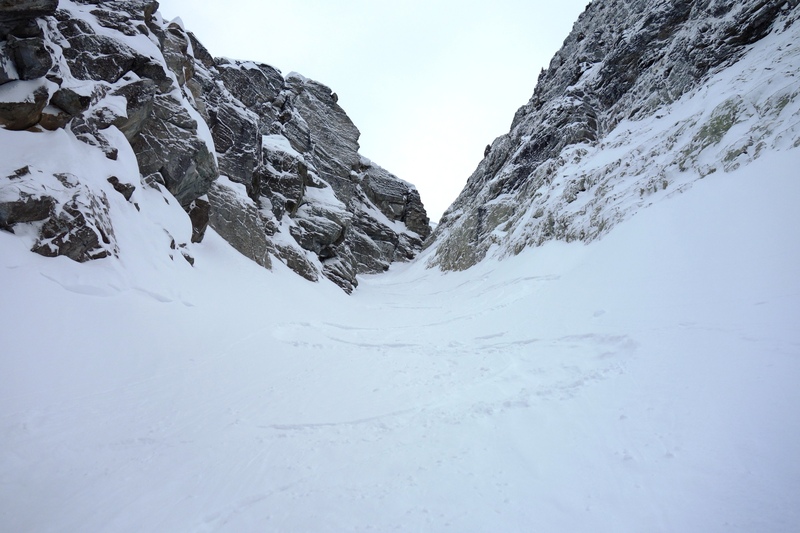 After a few initial turns the couloir became narrow and it was very icy. 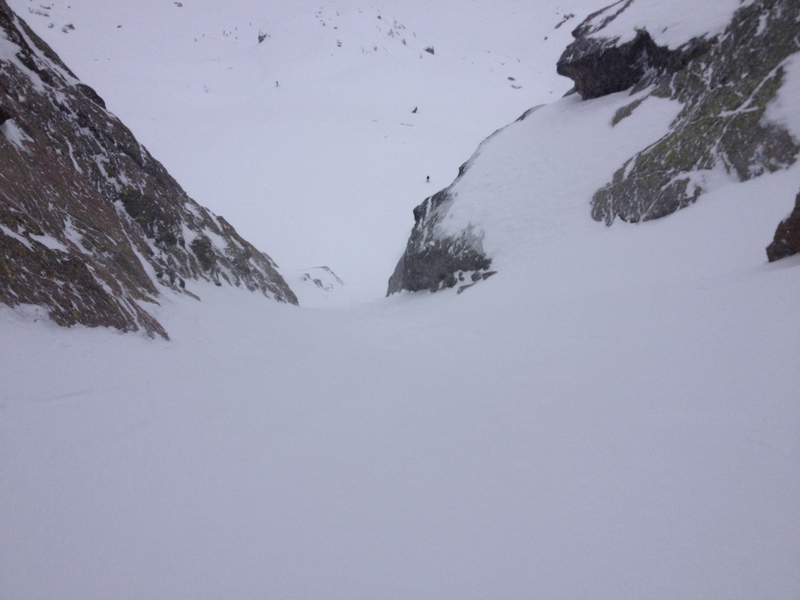 You could see that the people who skied it before side slipped it so we did the same until it opened back up and we could make some turns! There was a small rock step just after the dog leg, this was made tricky by the ice underfoot and the slight exposure below. 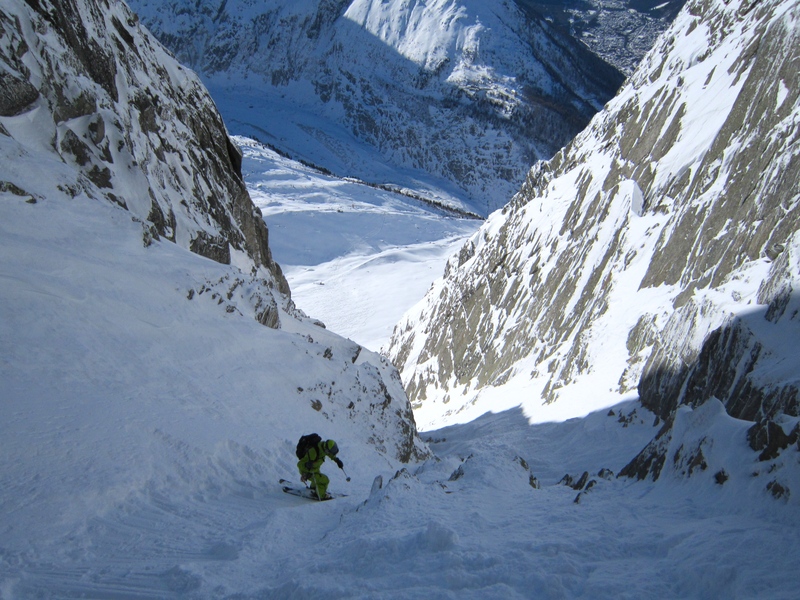 Into the main straight of the couloir we could make some nice turns in the deep cold snow. 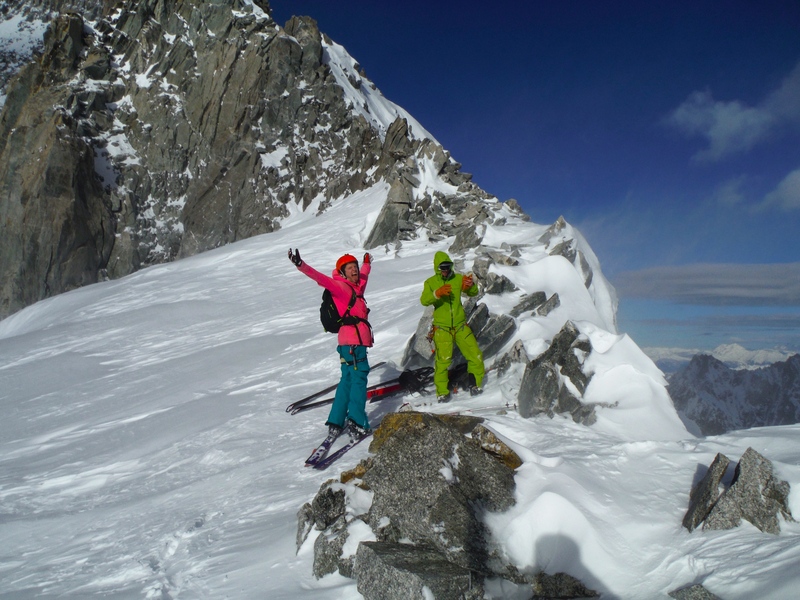 Although it was well tracked it was still a great ski and gave me and Ally some practice in making quick jump turns in variable snow conditions! There was a lot of sluff that would follow you down and build up around you if you stopped, it was light snow so it didn’t really affect your balance. 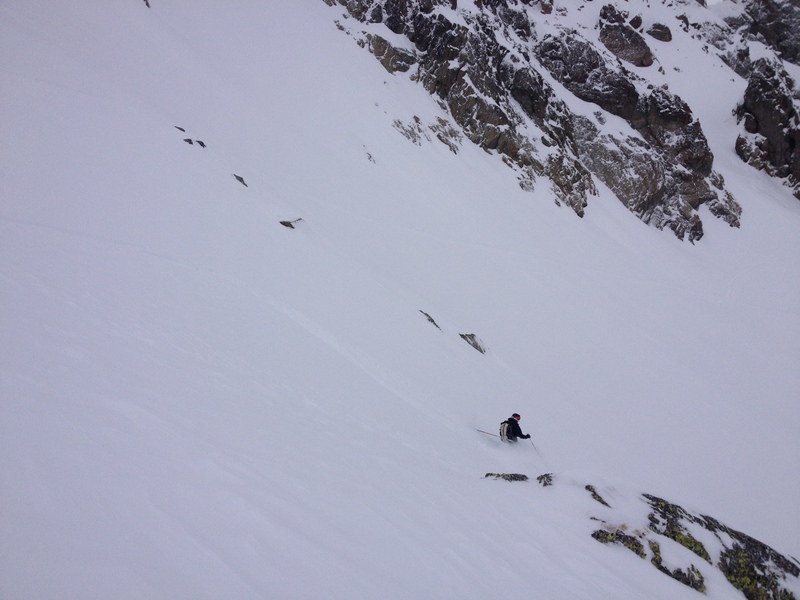 Ally making some nice turns down the main section of the couloir. Me mid turn. 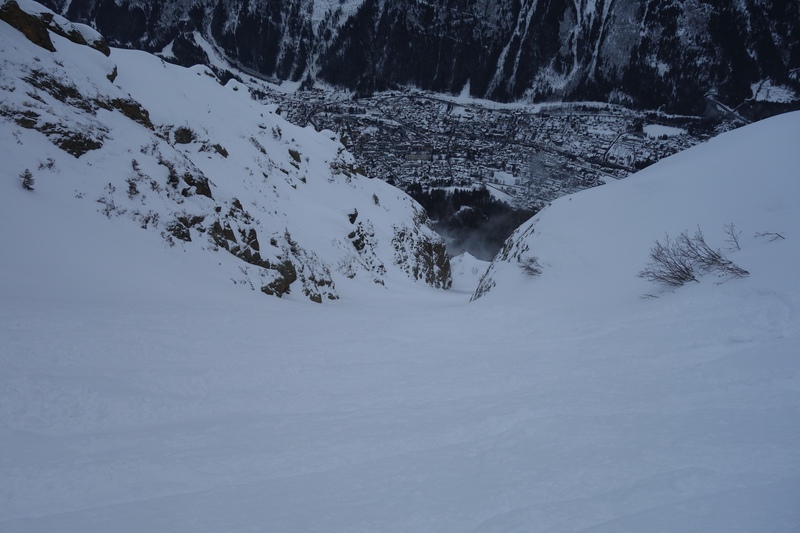 The last time I went down this couloir was last January on a snowboard and it was more filled in. Some more snow fall and it should be better. 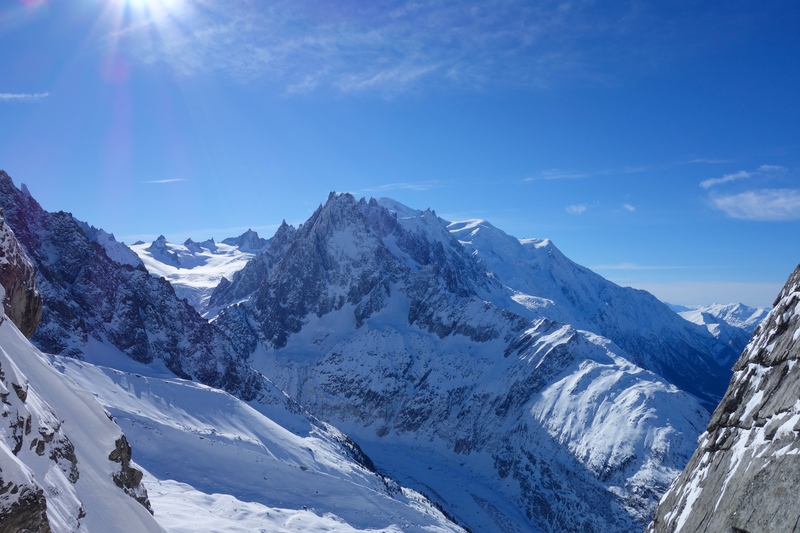 Skiing this aspect of Les Grand Montets offers some amazing views of the Mont Blanc Massif. 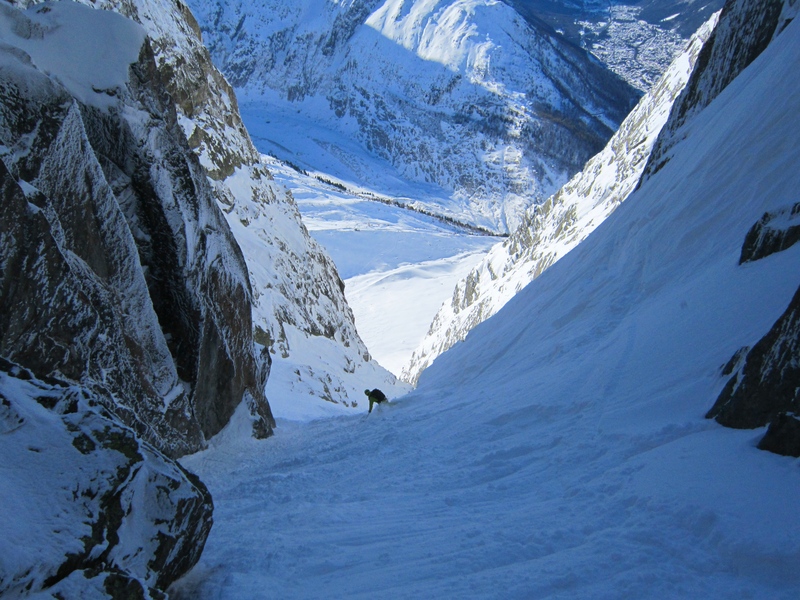 The couloir opens up after a couple hundred meters and joins on to the Pas de Chevre. 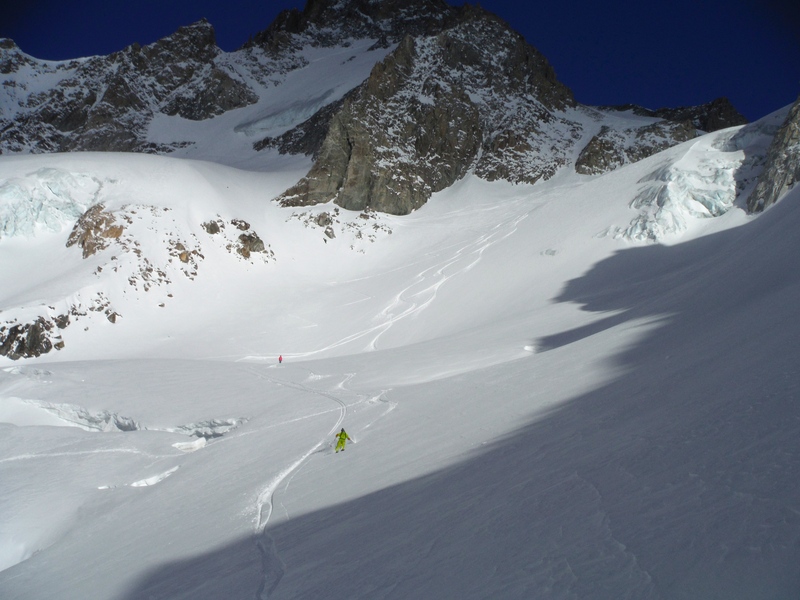 This huge open powder field gave us some great skiing before we hit the main route towards the moraine banks and the exit couloir to get to Montenvers. Another short rap from a tree on the way down but it is shaping up nicely for a ski to town, just need a little more snow. Below the Dru is an amazing place to be! The route is in red. What a great day, even with a hangover! Thanks to Ally for the company and Photos. Always good to have someone with the same idea of what a good days skiing is!! 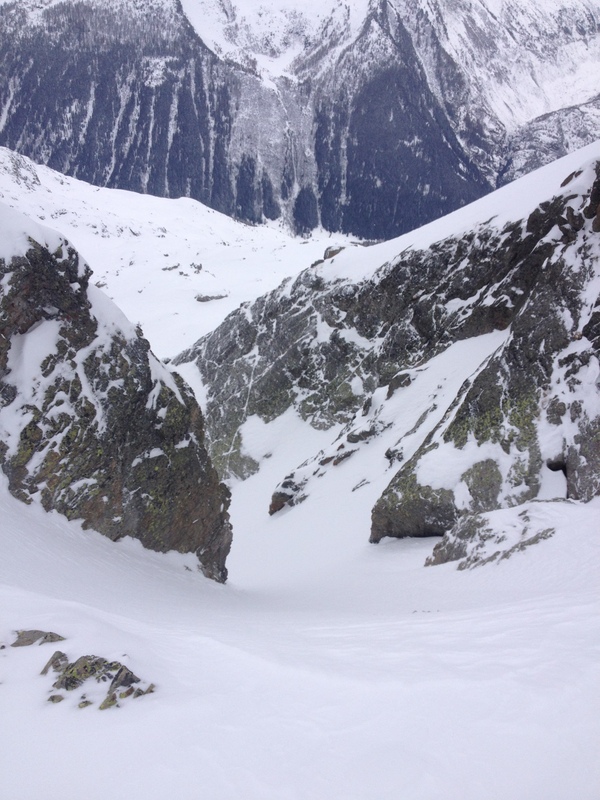 Couloirs all the way! Lets see what tomorrow brings. 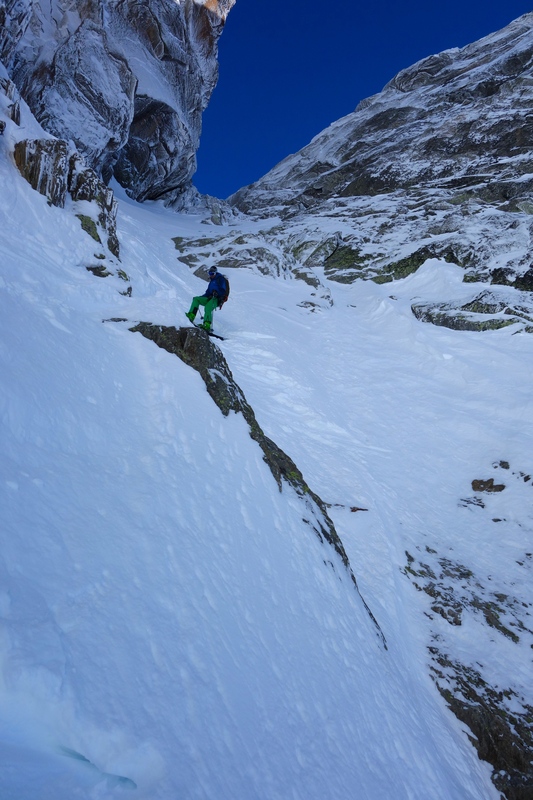 Maybe 4 Couloirs in 4 days. 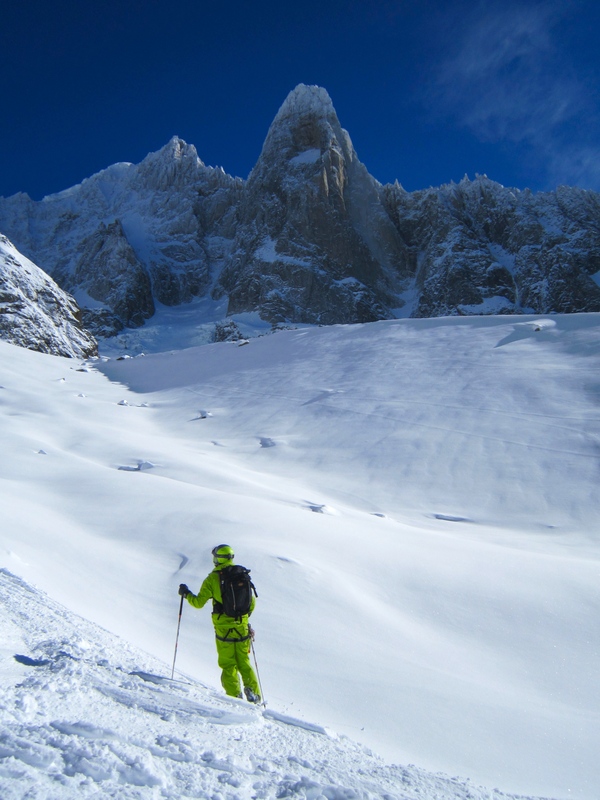 Winter feels like it has finally come to Chamonix. After 3 great days skiing I can now have a morning off and relax and let my body heal. It started Tuesday morning with heavy snow still falling and early bins at Grand Montets. There was about 30-40cm of fresh snow and it was nice and light at the start, Lapping the forrest we had great fun, then it started to get windy and there was more snow! I rode with about 20 different people as I was not in the mood for any waiting, this was a good move because I rode most of the lower section of GM where the best visibility could be found. 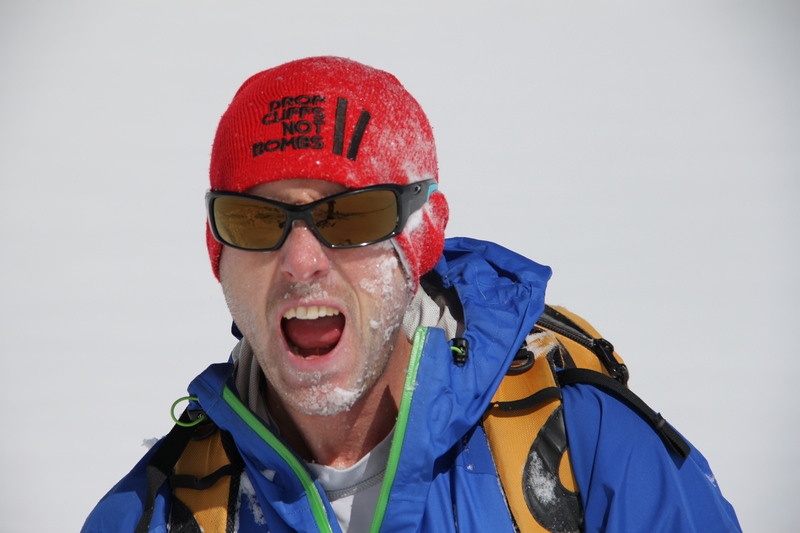 Roll on Wednesday… Meeting at LocalCHX at 8am I got my hands on a pair of DPS Wailer 112. 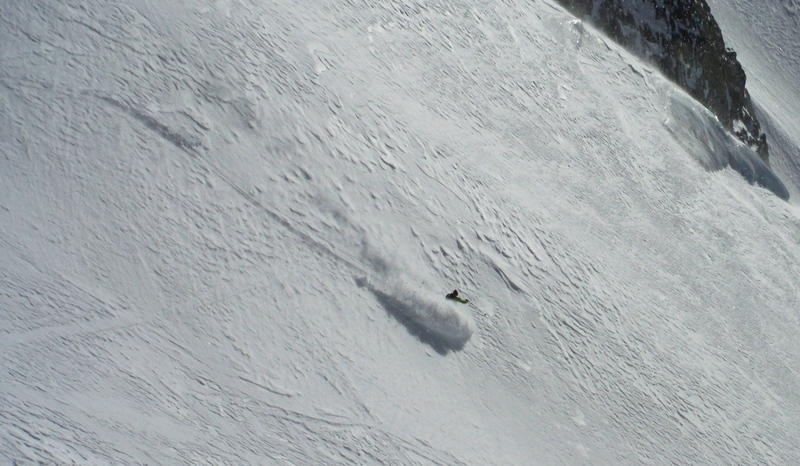 I know of a few people who use this ski and judging by the masses of tip rocker I knew they would be good in the powder. 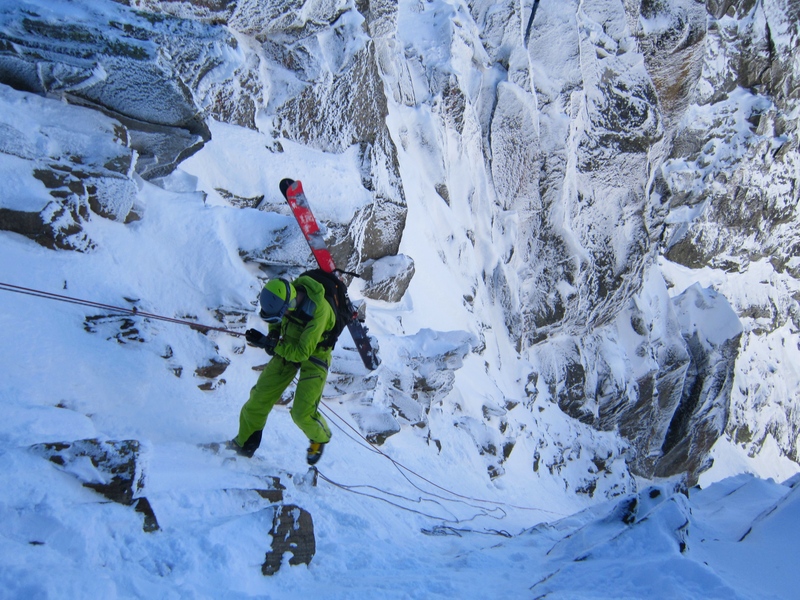 There were about 8 of us that were riding together in the first Midi bin and we were quick down the arete, Just behind the likes of Andreas Fransson and Seth Morrison. Cruising over to the Petit Envers we were digging trenches through waist deep snow, taking our turns to blast down the track and get a little further. 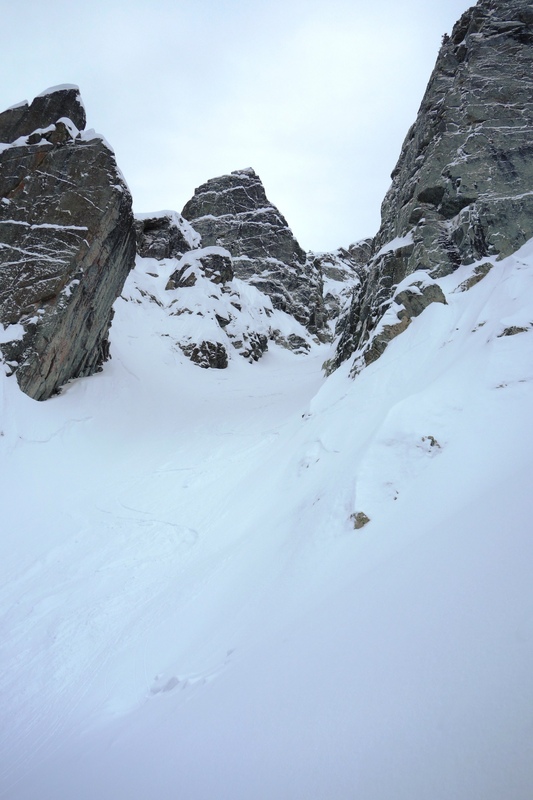 The lower pitches to skiers left of Petit Rognon were superb. 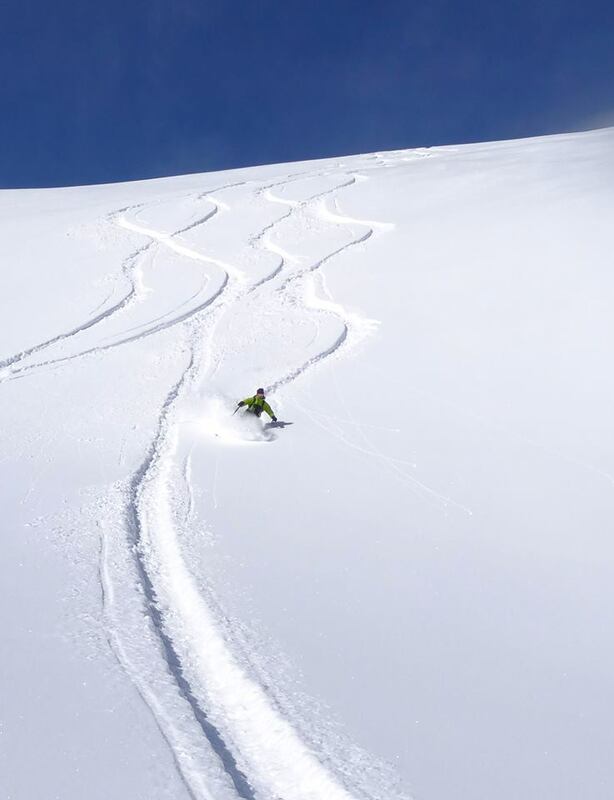 Open powder field with no tracks and bottomless powder, What more can you ask for. 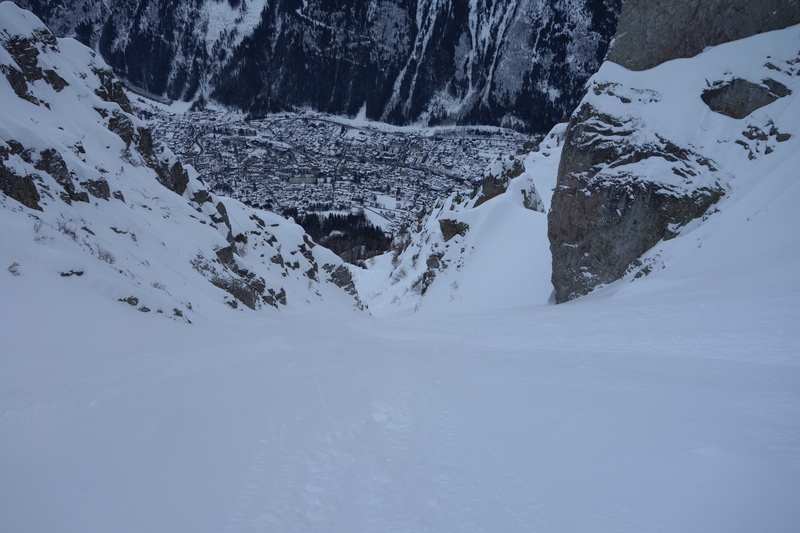 Meeting back up with the crowds breaking trail down on the flat we knew we had montenvers stairs to battle with but then we were on the train and back at the Midi ready for lap number 2. 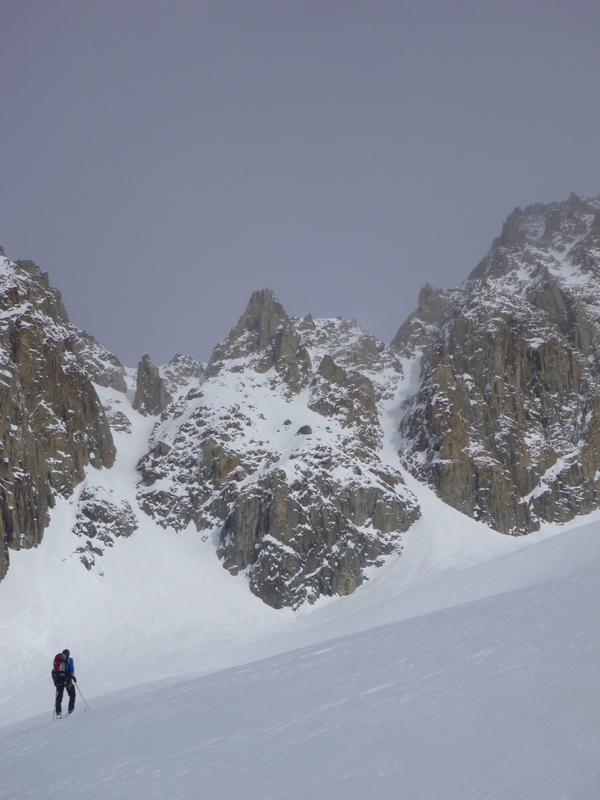 The weather had closed in around the arete and everyones goggles froze which made keeping your speed up to get to Gros Rognon very hard. At the top of the Gros Rognon we all lined up and rode it together, not ideal on a glacier but we were having too much fun, and could see a fari few tracks, so we could avoid the holes. 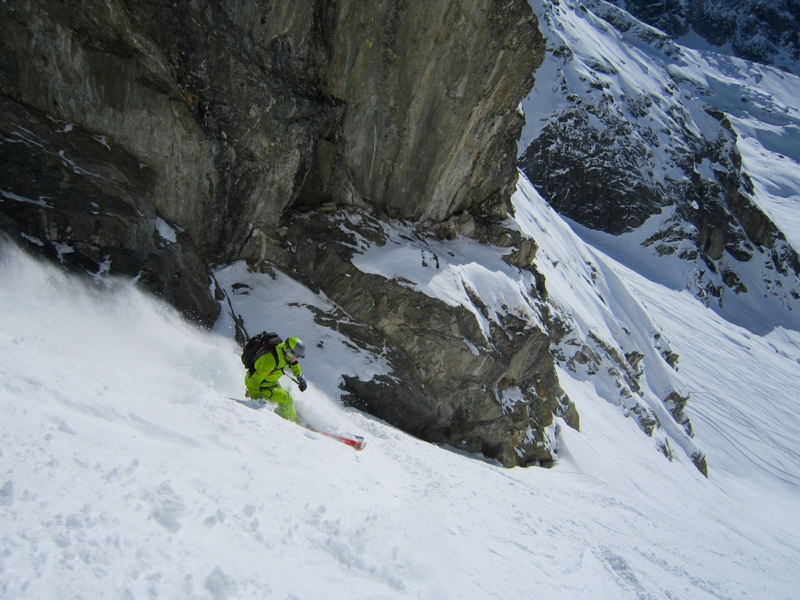 Dave Searle Charging the Gros Rognon. 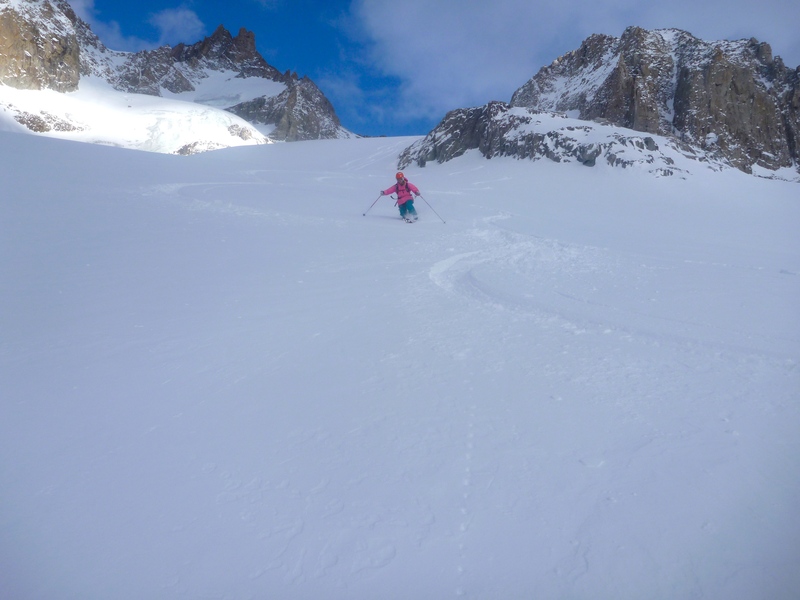 Taking the same exit down the steep couloirs just after the Requin we were back at the train again, this time too destroyed to do another lap but with the biggest smiles on all of our faces! Then Thursday came and I still wanted to go skiing. 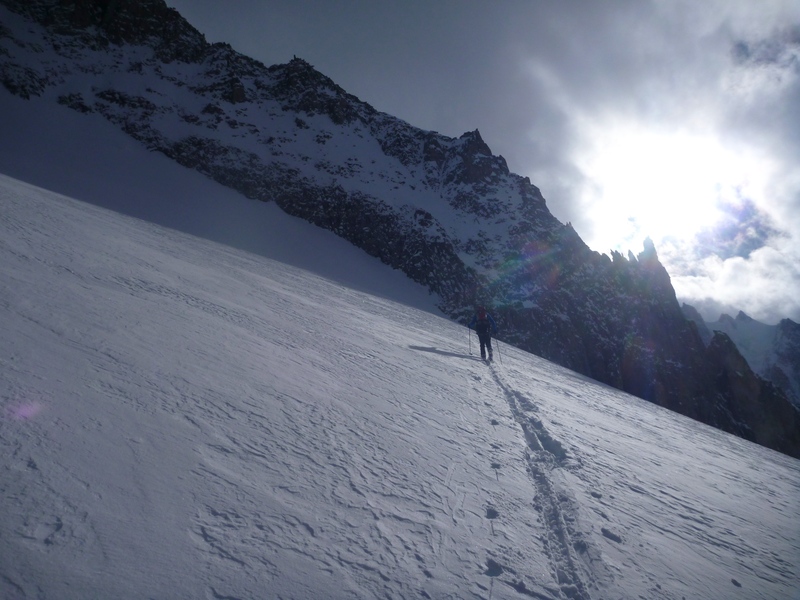 Heading up Brevent then straight across to Flegere I met up with Mike and Started skinning up the Col above Floria, With the intention of skiing it back down. Half way up I noticed this steep narrow couloir lookers left of the col about half way up. 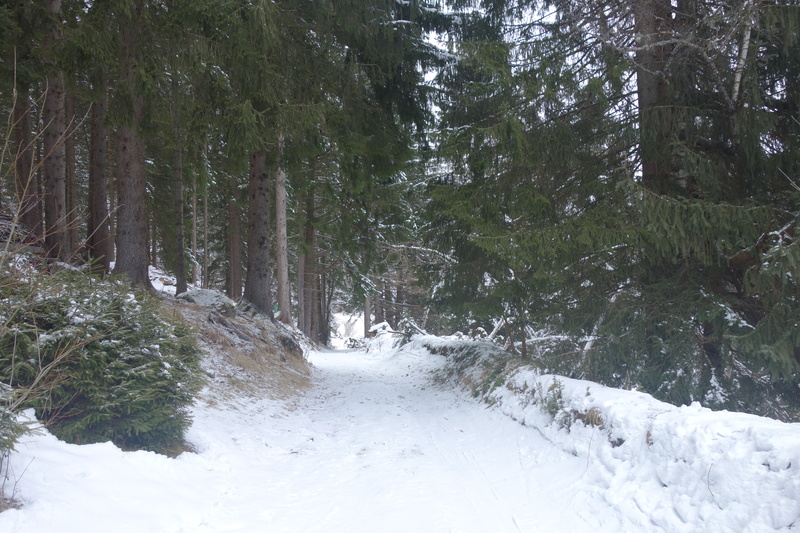 The snow was still soft and we had to break trail up but we had our skis on after 20mins of effort. 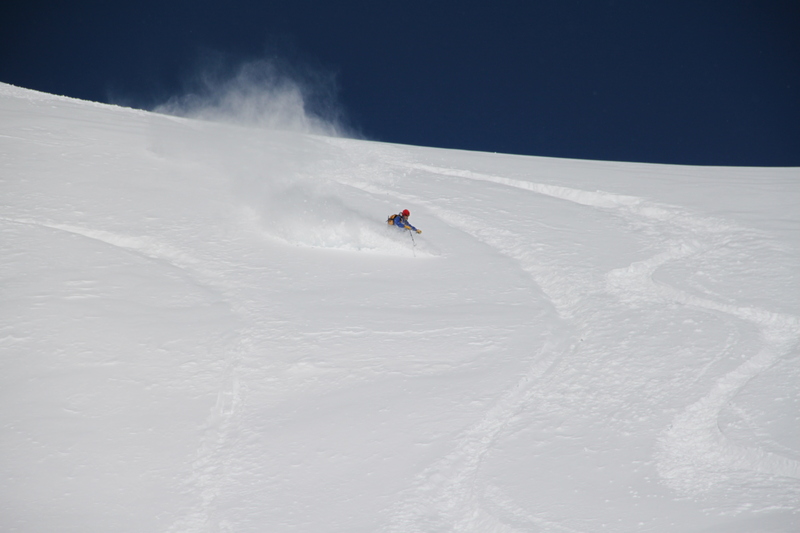 Mike chose to ski down the open face putting in some nice big turns in the untracked snow. 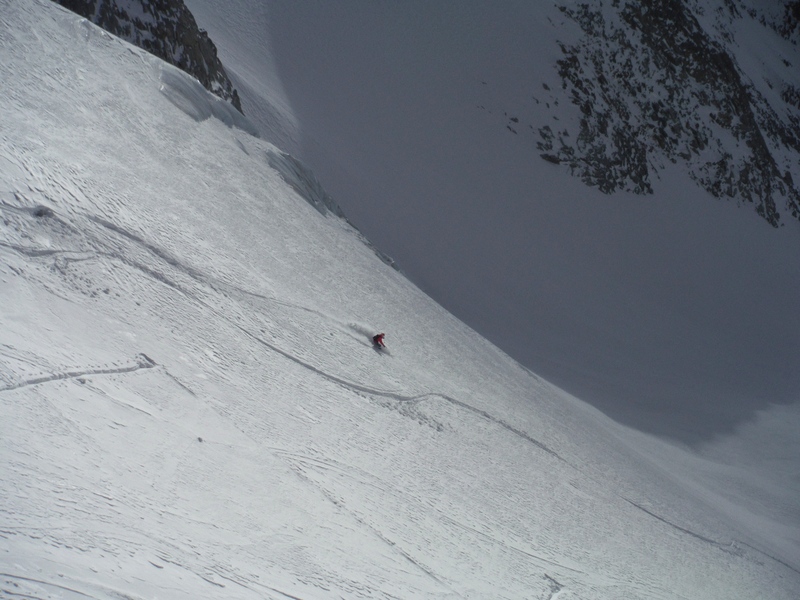 As I stared down the steep narrow couloir contemplating the best way in, I could see that the snow was heavily wind packed and would be hard work to ski. With the big opening below and Mike there waiting I gave it a go. Looking down the steep entrance. Side slipping in the first steep 10 meters I set off the avalanche that I knew would come. 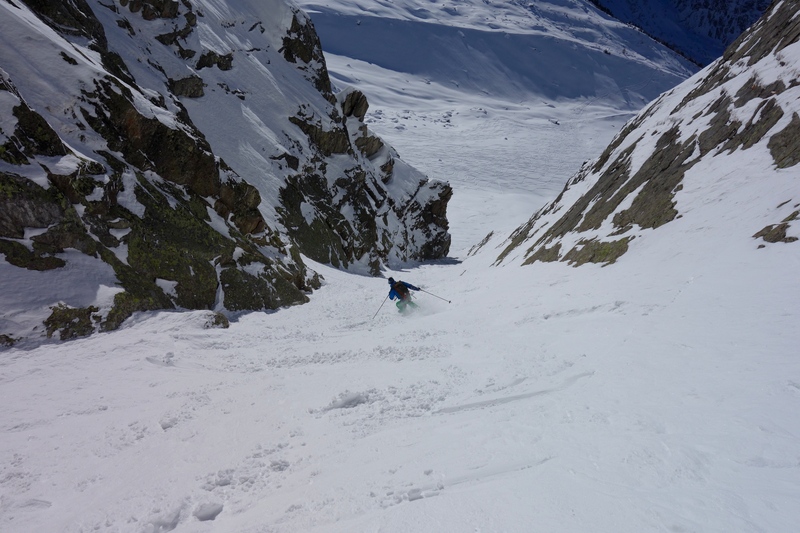 It cleared most of the hard wind affected snow down the couloir and left a soft heavy cover for me to ski. 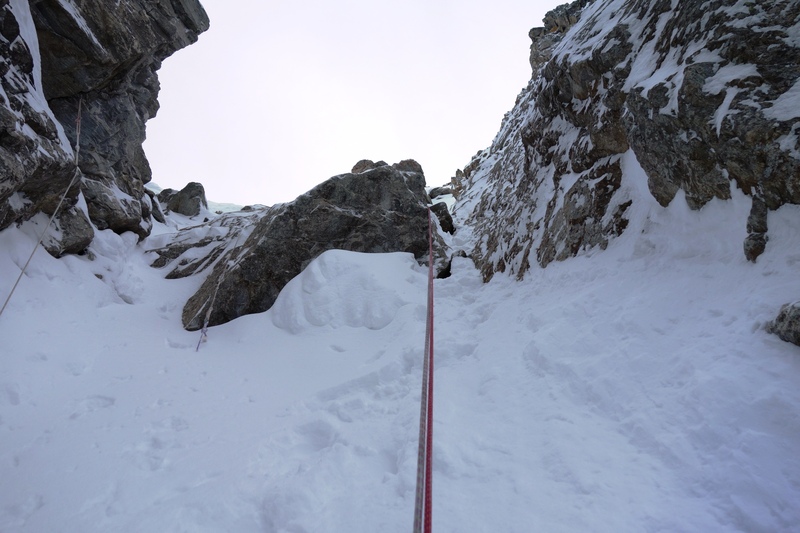 Half way down the 100m couloir it got very narrow. 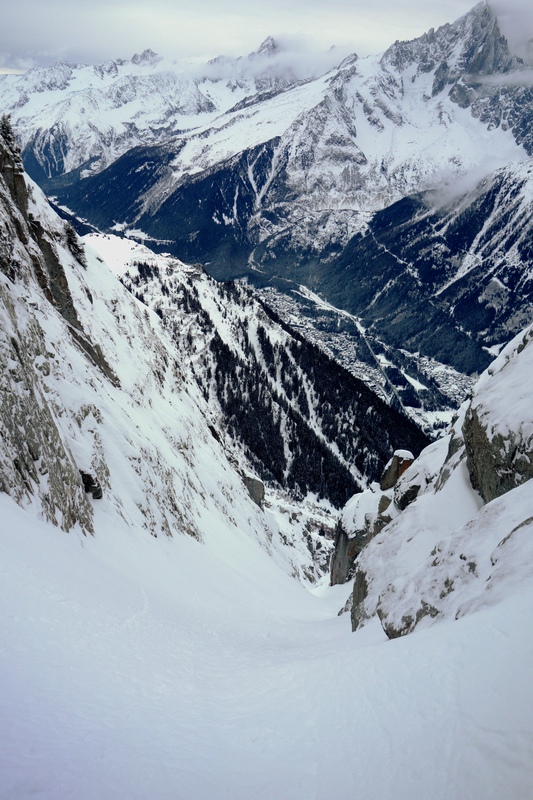 Making a half dozen slow turns I was out the bottom and was satisfied with my skiing, This was a small training couloir for the Rectiligne Couloir at Grand Montets that I really want to ski this winter. So, 3 fantastic days skiing with great people. More snow forecast for the weekend. Fingers crossed for 3 more of the same next week!